UP COMES THE LOFT FLOORING! 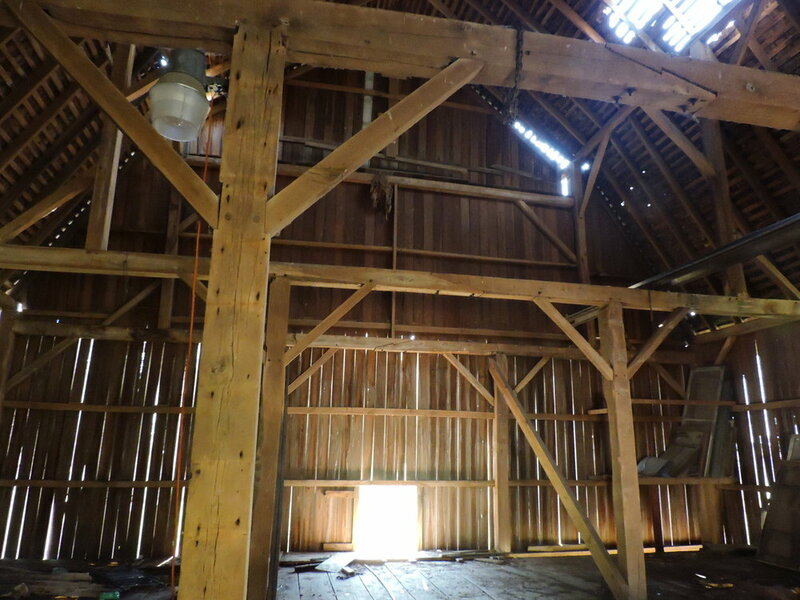 Amazing wide boards were used as the loft flooring in this barn. It has been kept in terrific condition. The saw marks are beautiful. I cannot wait to see what this turns into. DAY 3 OF DECONSTRUCTION- PROGRESS BEING MADE, ONE BOARD AT A TIME. The stall walls are coming down. The interior of the barn is being taken down one board at a time. We leave the beams and then move to the loft area. Taking up a lot of the flooring and any walls in that area. Next we will move to the siding. Hot day for hard work. When my friend and I talked about this concept of reclaiming barn wood and creating farm tables, we just never knew that it would turn into this amazing business. We are humbled by the feedback and encouragement that people have sent to us since September. Ignorance is bliss, right? I didn't know what I didn't know. And when I finally found a barn, true to form, it was one ridiculously enormous dairy barn! I could have it all, I just had to find a way to tear it down with no money, no tools, and no truck. On this Valentine's Day how special to share a message of love from a groom to his bride to be in 1912. While cleaning out the barn, we found a cigar box full of love letters from 1912 and an autograph book with writings from 1886. Frank worked in Little Rock, Arkansas. Cuba lived here at our house. I enjoyed reading their love letters back and forth and learning about their lives. Frank came back to Eaton for Cuba, and they married. I have the letter Frank wrote to Cuba talking about marriage and how he couldn’t wait for spring to come so she could be his wife. It is the only way to success! Even if the wood comes from the same barn, there will almost certainly be significant variations in color, grain, etc. — so if you’re a perfectionist or obsessed with micro-managing every little detail, reclaimed wood is NOT for you! Reclaimed lumber is beautiful and full of character. The more nail holes, splits, along with worm trails and weathering cracks more beauty and the more character. Just keep these things in mind when considering Reclaimed Lumber. I will walk you through the barn on our first day visiting it. This is what this barn looks like before we start deconstruction. This particular barn has a lot of damage to the roof. It would be extremely expensive to repair or replace it. The homeowners have decided to have it taken down while the lumber is still good and before it becomes too dangerous. Every message is read and responded to in 48 business hours, Monday - Friday 9am-5pm PST. Your message is of utmost importance to us, so if you feel we might have missed your email, feel free to drop a note again. We're here to take great care of you. Never miss a blog post. Sign up with your email to receive blog updates via email.